In case you missed this news buried in our previous post, we just wanted to let our customers know that ARTfarm has been pushed by the dry conditions to start our ‘summer’ break exceptionally (three months) early for this season. Regular farmstand hours will resume in the fall. In stark contrast to the usual photos we post of the farm, here is the current reality. 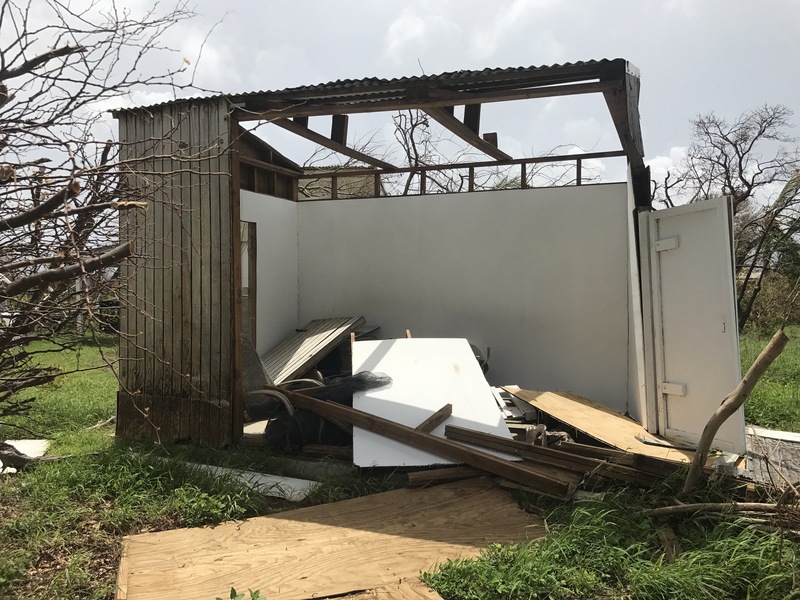 In the background, the ARTfarm greenhouse still needs repair from damages incurred in Hurricane Maria. Despite recent flooding events in Peters Rest and Gallows Bay, we are frustratingly dry at the farm. We have gotten an unusually low amount of rain so far this year. On Saturday, April 6th 2019 three brushfires started simultaneously within a quarter-mile patch of S. Shore Rd., including directly on ARTfarm pastureland. More than half of our farm acreage burned, destroying a large number of utility pole fence posts and fence mesh and wire that will need to be replaced (much of it was newly built in the last year). 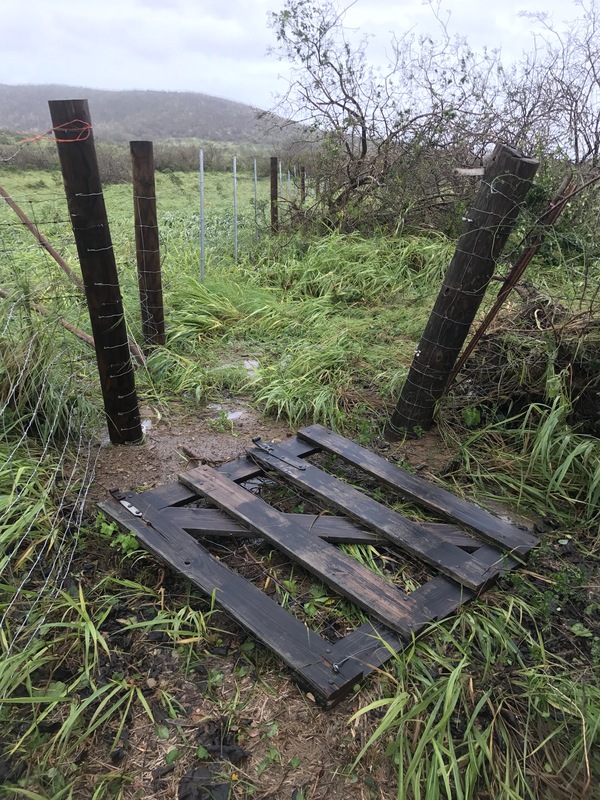 It also destroyed the majority of the pasture forage that we needed to feed our sheep and poultry. There have been a number of brush fires on the eastern end and north shore of St. Croix already this year. Things are incredibly dry. And there are some consistent hot dry winds exacerbating the lack of rain and scooping away moisture from the area. Honeybees and other pollinators, as well as mongooses, dear and other wildlife, are under extreme pressure in drought conditions to find food and water sources. 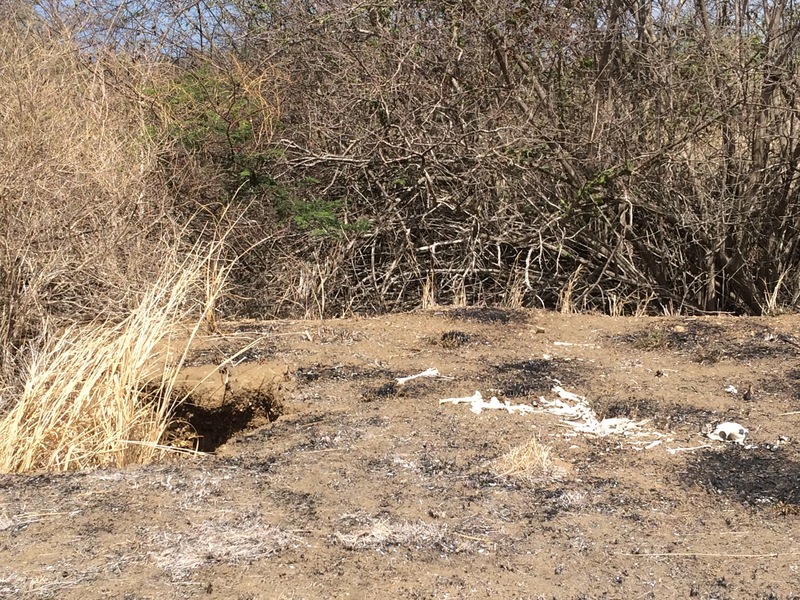 Farmer Luca has resorted to putting out dog dishes full of water for the mongoose population to keep them from chewing open his irrigation lines. 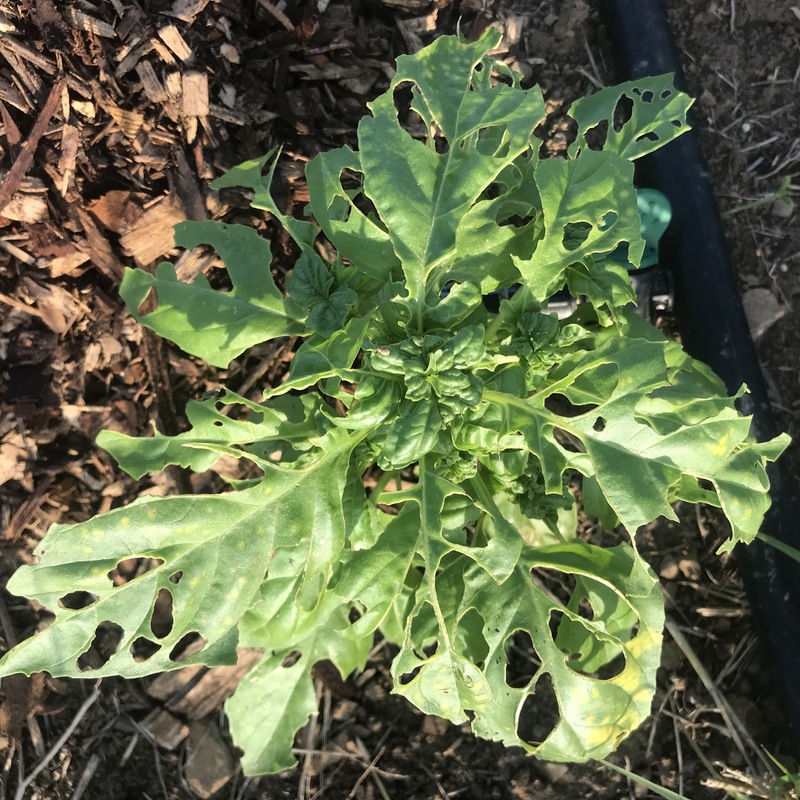 These extreme dry conditions mean that the same head of lettuce will grow much more slowly, only get half as large, and require much more water. If we are in for another drought like we had in 2015, we have to conserve some water for firefighting and to keep our fruit trees and animals alive. These fields were producing hundreds of pounds of tomatoes just a month ago… with dry conditions, the plants have been pulled out to conserve water. A quick flip through the archives of our website for the months of March and April in past years show that we are typically deluged with several inches of rain at this time of year. The little patch of green in all this brown is a partially buried Hugel bed. We built this one in 2015. We hope to build more of these in-ground Hugel beds throughout the farm. They require less watering and retain moisture. 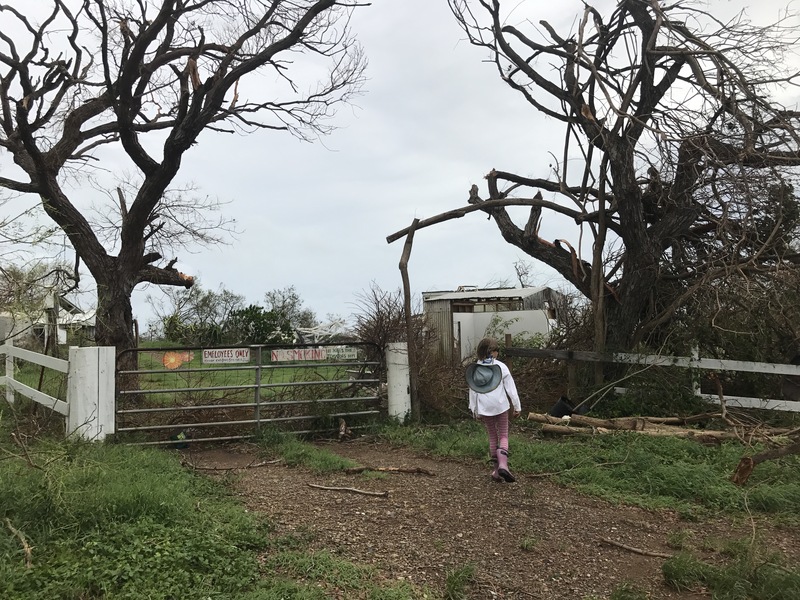 Given that we haven’t had time off since Hurricane Maria and we have a lot of infrastructure and rebuilding projects, and now the brush fire damage to recover from, we have decided to end our season early and turn our energies to these other pressing needs of the farm. 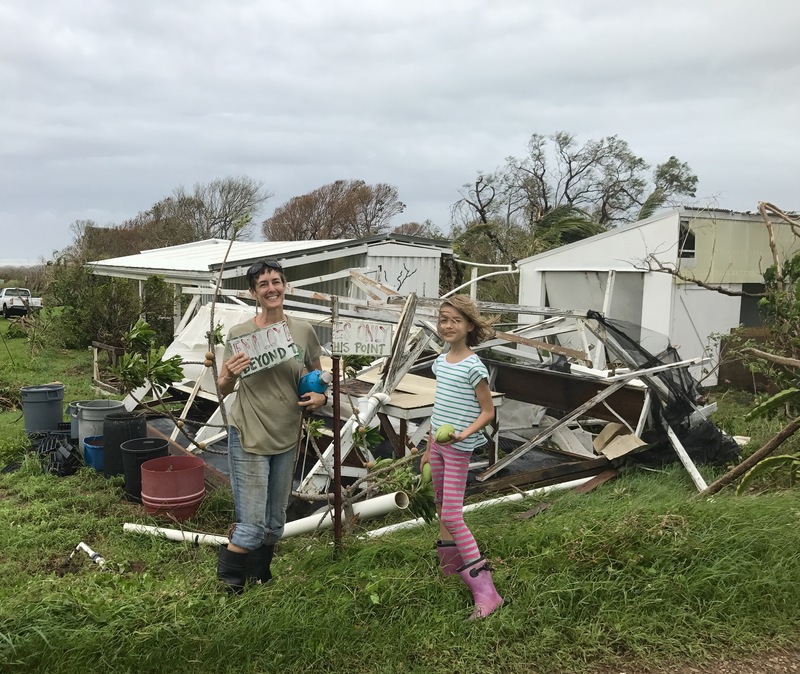 We may host a volunteer party and have friends of the farm come out and help us with some of the rebuilding effort. We are continuing to research, develop and build new permaculture practices for the farm that are climate change resilient, water-saving and soil-saving. If we happen to have a flush of pineapples or dragonfruit to share, we will post that online and to our email list and host a pop-up farmstand over the summer. We plan to reopen in the fall as usual. Tonight at Walsh Metal Works (now called ‘Studio Walsh’) in Peters Rest, Luca along with Mike Walsh and Clay Jones will be displaying artworks previously shown in St. Thomas at the Seven Minus Seven gallery. This is all new work from Luca, please come out and support his artistic efforts! 5pm till 8pm this evening (Friday, April 19th, 2019). Be sure to press your government representatives on climate change. And consider the UN FAO findings from 2014 that conclude that small farms are the best path to food security globally. Our ginger and turmeric plants have recovered following the storm and most of our fig trees that survived are starting to fruit. 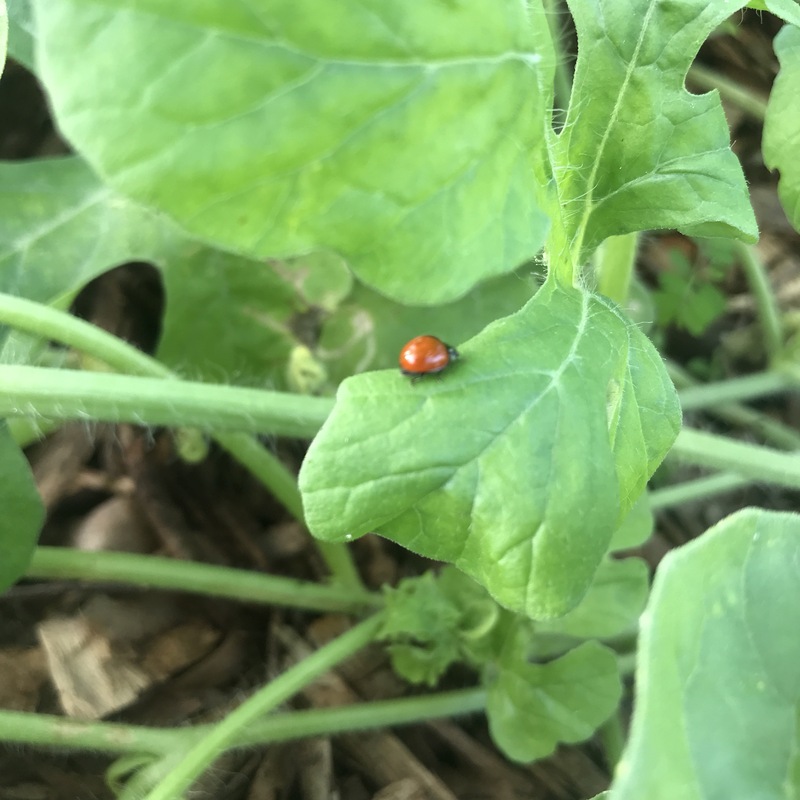 We are seeing a lot of caterpillars, ladybugs, aphids and other indications that a healthy insect population is rebounding on the farm. We have lost a lot of Jack Spaniard (paper) wasps, which are a big part of our integrated pest management (‘good’ bug vs. ‘bad’ bug) practices. The wasps helpfully eat lots of caterpillars, and their numbers were decimated by Hurricane Maria. But migrating swallows, ani (black witch) birds, kildeers and kingbirds have been active hunters in the gardens since the storm to help us protect our young crop plants from little munching mouths. Pearly eyed thrashers, normally the bane of tropical farmers because they attack crops directly, are switching to a caterpillar diet due to the lack of available foods for them. Thrashers are also eating gungalos – this is unfortunate, as they are a beneficial soil-building insect, but noteworthy as it is not a typical part of the bird’s diet. Apologies for the short notice: As we usually do, we are going to take a few weeks at this slowed-down time of the year to do some maintenance work, some reflecting, catching up on projects, and taking a little time for ourselves. So at the risk of seeming a bit abrupt, we are letting you know that we will not be open this morning, Saturday, August 22nd. We will probably reopen in mid to late October, depending on whether or not it rains and for enough duration to help our soil recover from this extensive drought. Making lemonade from lemons. 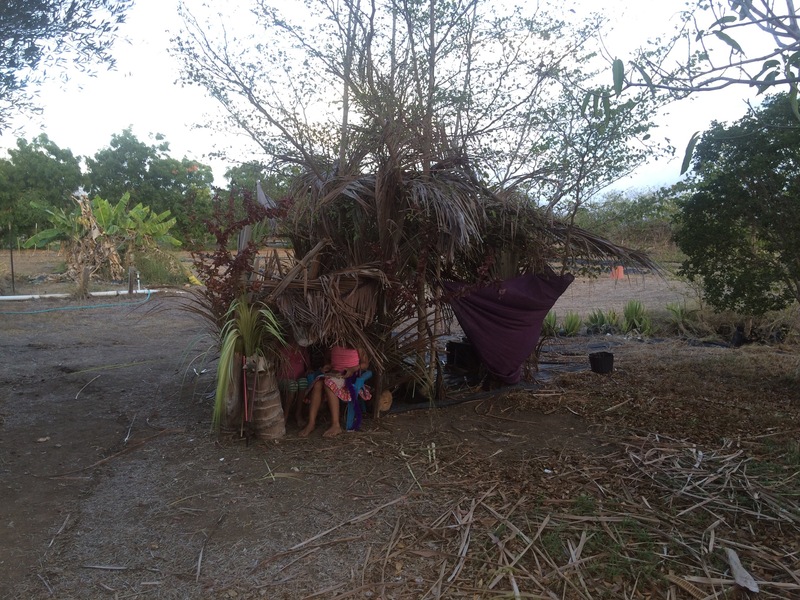 Here’s something fun to do with dead coconut trees: build a shady little fort to hang out in! Speaking of the drought, we may be on the road to recovery after this weekend with a visit from tropical storm/depression/hurricane Danny, and hopefully with a few more precipative events in his wake. Keep in mind that for us and many other livestock and crops farmers, it will take time after rains arrive for our farms to recover. It is not going to be an instantaneous recovery once water hits the soil. Many pastures taxed by lack of rainfall and extended grazing periods will have to be reseeded. The balance of beneficial organisms in the soil has been altered by months of dry, punishing heat and wind. There is going to be a long road back to good soil, sward and plant health, after not having any substantial rain since February. Big shout out and thanks to Sejah Farm, who collected donations from the public for drought relief and used the money to purchase hay, grain and milk replacer and distributed it among their production partners. We received two pickup truckloads of baled hay for our sheep. Thanks to everyone who donated. JCC, you should be sleeping well at night! Special thanks for your support for our island farmers.